Welcome, Husker Nation, to another edition of the Carrier Chronicles, and today I have joining with me a very special guest, Mr. Blackshirt Mr. Mick Stoltenberg. How ya doing my friend? Mick Stoltenberg: Doing good, how are you? Adam Carriker: I'm doing good. Now you guys are wrapping up winter conditioning, getting reading for spring ball. So talk to us about winter conditioning. How'd that go this year? What are some of the guys who stood out and what are some of the things they did different from previous years? MS: Well it went great! We had a little kind of workout captain system going so we all kind of had our little team. We all voted on captains so a lot of guys performed pretty well and doing some good stuff and some competitions but personally I gained about 20 pounds total so I'm kind of up to around that 310 pound mark now so that was a little crazy for me to kind of gain all that weight again but I'm feeling pretty good and feeling pretty in shape for spring ball. AC: Now I read somewhere you put on 50 pounds since your first got here, now you've put on another 20 pounds. You've put on 70 total pounds! Talk to me about putting on another 20 pounds throughout this winter conditioning. MS: Well, I just tried to kinda up the daily calorie intake and not gain any real bad weight. But when I go down there and run I really don't feel the weight too much. I feel pretty in shape for gaining the weight so hopefully it feels good all the way through spring ball and I can kinda stay around that range during the season too. AC: Now is that something the coaches wanted you to do as part of moving to the 3-4 defense? Is that just kind of what happened as part of working hard? Talk to me about that process. MS: Yeah, it was Coach Parrella told me that I was kinda in the middle so he wanted me to put on a little more weight. Kind of be more stout in the middle so I could get anywhere as high as 315-320 depending how spring and how the summer goes but right now I'm kind of around that 310 pound range so it will be good. AC: Now when you say "in the middle" are you referring to nose guard in this new 3-4 defense? MS: Yeah, it's where they'll put me there at first and then I think guys will probably move around depending on how we perform in spring ball. It's kinda hard to say who will play where exactly now without really having taken any real contact reps. So that's where I'll be initially and then our team will kinda go from there and see how everyone develops. AC: Okay, I want to circle back to winter conditioning a little bit more in a moment but day one, spring practice. Do you know whose going to be lining up where? Who kinda (is) going to be the right end, left end, nose guard? Whose going to be starting with the 1s and the 2s? Do you guys know that yet? MS: Not quite. I think we kind of have a basic framework idea of what's going on. For the three down lineman it will probably be me, Freedom, and Carlos and then I think it will maybe they could alternate either one strong or weak but that will be the three down defensive lineman that will start off at first. AC: Okay, so they're putting you at the nose, Freedom at the end and Carlos Davis at the other end? AC: Okay, very cool! Who are some of the other guys working out at nose guard behind you? Cuz that's been the big talk this off season. 3-4 ... gotta find a nose guard. So who else is working at the nose guard position with you right now? MS: Kahlil Davis is with me right now so we're kinda the two noses right now. And then behind him is Joel Lopez, he's going to be a senior so we kinda got three guys working at that middle spot right now so things are kinda going to change around a little bit probably but as of now, that's kind of the basic framework we have. AC: Okay, cool. So for me, having played in the 3-4 myself, I always viewed the outside pass rushers as the most important of this defense. The nose guard has gotten all the pub cuz, whose it gonna be? So who are kinda the two outside pass rushers that they're looking in this new 3-4 defense they're looking at? MS: Again, I'm not really 100% sure who's going to be the STUD guy yet but I think as far as like the outside linebacker/rush end it's probably going to be like Alex Davis or Sedrick King are two guys that are working there. And then as far as the other one I think like Marcus Newby and Luke Gifford and a few -- probably Tyrin Ferguson and a few other guys. I'm not really 100% who's going to be where exactly yet but they kind of have a little bit of a general idea right now. AC: Okay, cool. Let's circle back to winter conditioning. So I'm always curious cuz strength coaches every year they do some different things, they learn something different. Even guys who've done it for 3 decades. Coach K when I was there every year we'd come back and do something a little bit different. So I'm curious what it was like -- the difference between this year and last year. And even the difference between the strength and conditioning staff now versus a couple years ago? The things that have changed? MS: Well for me personally it's a lot better, um obviously last year, last December I -- or two summers ago I tore my knee up so guess it's a lot better now being able to get stronger instead of just recovering so that's obviously been a huge difference for me. I was able to put on some weight and get a little stronger there but they started off the program doing a -- they called it metabolic circuit which was pretty challenging. It was every lift was like three sets of ten and then it was uh, kinda one after the other with no break. So that was something (that was) the main focus of the first weeks of the program to kinda get us back into shape so that's one thing we kinda highlighted a little bit different so ... yeah it was definitely pretty challenging but it was a lot of fun. MS: Exactly, Yeah there's definitely some guys who suffered after those ones! But definitely good for us as a whole for sure. AC: I think they get more of a kick out of that than watching guys squat 500 pounds! The just enjoy torturing people sometimes I think. MS: Oh you know they do! They definitely do. They won't say it, but it gives them a little excitement to see us suffer a little bit. AC: It's that messed up predatoral look they get in their eye but I gotta ask, who stood out? Who stood out in winter conditioning this year? Maybe some of the guys we don't know, maybe some of the freshmen? I know there's five early enrollees right now. Who should we be looking out for going into spring ball? AC: Alright, so this 3-4 defense ... I gave some tutorials if you will when it was first announced about Bob Diaco being hired. But as a guy who's been talking to the coaches, I'm sure you've discussed some of the things that will be different -- what are some of the things Husker fans can look forward to? The changes going into this new 3-4 defense going into the spring practices? MS: I guess one thing I didn't know about the defense is it's not always a 3-4. They'll reduce it down to kind of more that 4-3, that over look, about half the time. So it's going to be more of a multiple defense than maybe some people would imagine. So it will definitely create some preparation problems for the offenses that we're going to play against so that's one thing I think is pretty cool is how many different fronts we're going to have and how much we're going to move around. I think that multiple D aspect is going to be pretty cool. AC: Now I've heard based on how guys perform this spring, Bob Diaco does have familiarity with a 4-2-5 defense. Have you guys talked about that at all as of yet or is that just something he's going to wait n see how guys perform? MS: I'm sure that's something going to be something we'll see a little bit later. We kinda went over most of the basic framework stuff for now but I'm sure that's something that will definitely come up and we've been watching tape of some of these old defenses and it looks like they've done a lot of different stuff that we haven't really gone over yet so I'm pretty excited to learn it. AC: I gotta ask you this question, most of my questions aren't too hard, but this one -- honesty could get you in trouble, but honesty is what people wanna hear. Cuz I've played in 4-3, I've played in 3-4. And a 4-3, especially under Banker, it was a D-lineman's dream. Just get up the field, penetrate and make plays. In this 3-4 it's a lot more double teams, it's a lot more physical and it's kind of a linebacker's dream, if you will. So, I actually enjoyed playing in a 3-4 cuz it was challenging to me, it was a different challenge. So for yourself, are you excited about transitioning from the 3-4 defense from the 4-3? MS: I definitely am. Like you said, you said it was a challenge for you. Our coach, Coach Parrella he said when you're in the 3-4, it was really difficult for a lot of the guys he played with to get it down but he said once you get the 3-4 down and learn how to 2-gap and stuff it's usually a lot better once you go to the shade or the 2-i. So I'm definitely pretty excited to learn how to 2-gap and how to do it effectively cuz I think it will make all of our games a lot more complete so yeah, like you said it will be a fun challenge for us I think. AC: All right I got two more questions for ya. 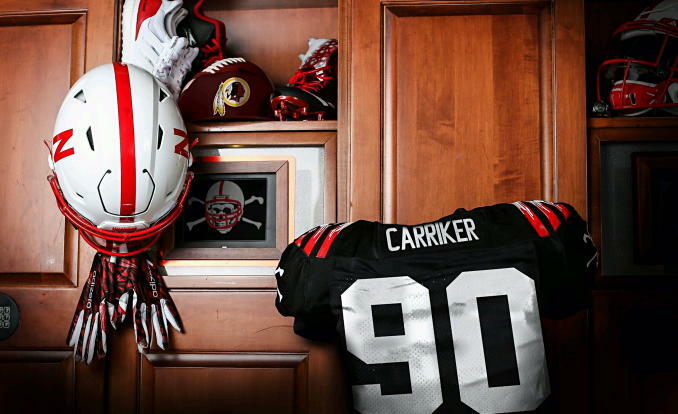 So, I looked up some stuff on ya, came across this video of you getting your first blackshirt. So talk to us about what it was like growing up in the state of Nebraska and always, ya know, basically your childhood dream according to what I saw was to plat at Nebraska and earn that blackshirt. So talk to us about what that was like, what that experience was like for you on that day. MS: I guess we knew the blackshirts were going to get handed out, but, and I was running with the 1s, but I really still didn't know if I was going to get one I was like, in my head I didn't think it would really be something that's just like, would happen so quickly. But when I went down and say it I was just like shaking. I just kinda walked over, picked it up and then, we had to get around and get to practice and I had to try and hide my emotions for a little bit. But yeah right when I got it I was definitely tearing up, it was just a really cool experience. The guys were congratulating me and stuff like that. But like you said, it's something you really always wanted if you're growing up around here so for it to happen was just surreal. AC: All right last question. Tell us something we don't know. Obviously nothing's going to get anybody in trouble but a locker room story, a behind the scenes story ... something about Bob Diaco, what don't we know about Bob Diaco? To give us something there? MS: He's a really well-dressed guy, I guess you guys have seen that but he's always wearing like a really nice suit or something around the offices where some of the other coaches are kinda wearing sweatpants or jeans or whatever so, he's definitely a real professional looking guy. I think once we get to know him we'll probably have more of those little stories just as for now he's just a fancy dresser which is pretty intimidating but it's pretty cool seeing him walk around with his nice clothes on. AC: So when it was announced, you know and I put out my thoughts on Coach Diaco being hired, I had like three women hit me up, and one of them is a member in my own family and she shall remain nameless -- like "Yeah, press conference is going to be so much more fun to watch now whether we win or lose!" #hottie. And I'm like I never looked at it like that but I do appreciate your input Susan, now I'll drop her name, but not her whole name, that's one of them. Um, okay talk about Diaco, the meetings you've had, the conversations beyond the "ridiculous good looks" as Zoolander would say. Talk about him as a coach. MS: He just seems like he'll be the ultimate players' coach. It's kinda what his mantra is when he talked to us just about the fact he's been through it and knows some things we look for as players. So he just says inherently he's going to love all of us and he hopes he can earn that trust and love back from us. But I definitely think he takes all of our opinions and thoughts into consideration when he makes decisions plus he's just a really fiery guy, real exciting to talk to so I think that's one thing a lot of us are looking forward to entering spring ball here so we can actually kinda see him out on the field. MS: ... THROW THE BONES!